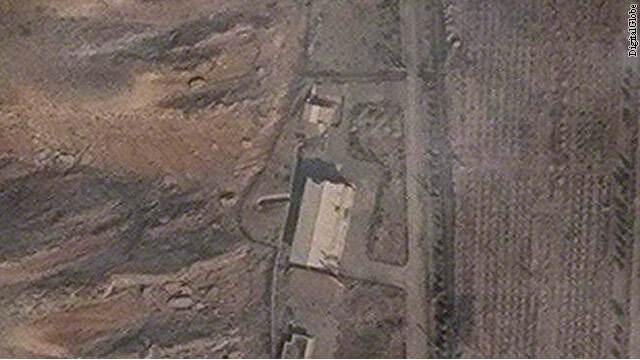 A Washington think tank says it has identified the building at an Iranian military base where international inspectors suspect Iran may have conducted explosives tests connected with a possible nuclear weapons program. Albright, who is a former U.N. weapons inspector, and his colleague Paul Brannan said in an analysis provided to Security Clearance that the building is notable because it "is located on a relatively small and isolated compound within the Parchin military site and has its own perimeter security wall or fencing. A berm can be seen between this building and a neighboring building." The institute examined satellite imagery of the building dating from 2004 and 2011, pointing out the various features. A senior U.S. official who would not speak for attribution because of the sensitivity of the information confirmed Albright's assessment. "We know explosive compression was done at this chamber. This is where explosives are," the official said. The International Atomic Energy Agency has repeatedly asked Iran for access to the Parchin site, but the nuclear watchdog group has been denied permission by the Iranian government. Iran last week indicated it would now allow inspections at Parchin, although no date has been set and it was unclear what conditions there might be for a visit. According to Iranian TV, Iranian Foreign Ministry spokesman Ramin Mehmanparast said a visit by IAEA inspectors would be conducted within the framework of an agreement between Iran and the agency. Yukiya Amano, the director general of IAEA, told CNN's Matthew Chance last week that "we have the indication or information that Iran has engaged in activities relevant to the development of nuclear explosive devices" at Parchin, and added, "Iran is not telling us everything." In a recent report, the IAEA said it had information that experiments with a nuclear detonation system may have been conducted inside a large metal container within the building at Parchin. Parchin is used for research, development and production of ammunition, rockets and high explosives. The IAEA has had only one, limited tour of Parchin. That was in 2005. Twice this year the weapons inspectors have been refused access to the complex by Iran. "The worry is that the longer the inspectors are denied access, the more Iran can clean up the place," Albright said. The few images the Institute for Science and International Security had access to did not show any clean-up effort, but Albright said such work going on inside the facility. Iran denied Tuesday that it was trying to clean up evidence of nuclear activity at Parchin. "Those who have technical knowledge on nuclear issues would know that such propaganda is unjustifiable as evidences are irremovable from an area with nuclear activity," Mehmanparast said on Iranian TV. However, the senior U.S. official said American imagery shows a clean up. "We see clean up, but we don't what they are cleaning," the official said. "We know they are up to something." And two Western diplomats have told CNN the satellite images show trucks and earth-moving vehicles at Parchin, and although the purpose of the activity is not clear, it does seem to buttress IAEA concerns that the Iranians were trying to clean up the site before any potential inspection. The senior U.S. official also said the evidence is clear from this site that Iran had pursued a weapons program. "There is no other reason to conduct explosion compression in the context of Iran other than nuclear testing. There is only one thing they could be trying to simulate and that is a nuclear explosion," the official said. Iran has repeatedly denied Western allegations that the goel of its nuclear program is to build a nuclear arsenal, but the IAEA has said Iran refuses to provide sufficient access or enough information to satisfy inspectors that the government is not engaged in a weapons program.